1. YOU COULD HELP SAVE SOMEONE’S LIFE. Performing CPR can help preserve an individual’s brain function during cardiac arrest. As such, learning how to conduct this procedure enables you to supply oxygen to a cardiac arrest victim, increasing the chance that you’ll be able to keep this individual’s blood flowing and vital organs alive. 2. YOU CAN MAKE A DIFFERENCE FOR CARDIAC ARREST VICTIMS WORLDWIDE. Sudden cardiac arrest (SCA) is a major problem, yet few people know how to identify and address this issue correctly. The AHA points out roughly 92 percent of SCA victims die before reaching the hospital. However, the AHA also notes immediate CPR can double or even triple a cardiac arrest victim’s chances of survival. Becoming CPR-certified can make an immediate difference for a cardiac arrest victim and his or her family. And if you ever have to perform CPR, you could help increase the survival rate of cardiac arrest victims worldwide. 3. 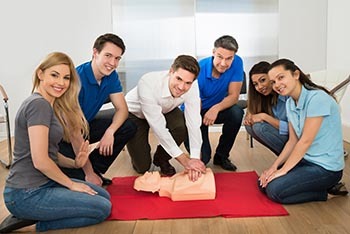 YOU CAN SATISFY THE GROWING NEED FOR CPR-CERTIFIED INDIVIDUALS. The AHA trains more than 12 million Americans in CPR each year. Yet this total is not enough. Knowledge is power, and becoming CPR-certified gives you the skills and know-how you need to save lives. And as a result, a CPR-certified individual can meet an important need, as he or she can help EMS, police and fire departments assist cardiac arrest victims. 4. YOU CAN BECOME EVEN MORE VALUABLE IN YOUR OFFICE. What would you do if one of your co-workers suddenly goes into cardiac arrest in your company’s break room? If you know how to perform CPR, you can provide immediate support. Learning how to perform CPR instantly makes you more valuable in your office. Therefore, those who devote the necessary time and resources to understand how to conduct this procedure can add yet another skill to their portfolio. 5. YOU WILL LEARN HOW TO USE AN AUTOMATED EXTERNAL DEFIBRILLATOR (AED). An automated external defibrillator (AED) is a portable medical device that may be used in an SCA emergency. The device analyzes the heart’s rhythm and delivers an electrical shock to the heart as needed. By doing so, an AED can help restore the heart’s rhythm. Thanks to CPR training, an individual can learn all about AEDs, how they work and where to find them. CPR classes teach students how to effectively use an AED to help reduce the loss of life in SCA emergencies.